I have owned several pairs of DeFeet gloves in the past years, and like to race with them on. A new version has been brought out – DeFeet e-touch dura gloves – so have bought two pairs. 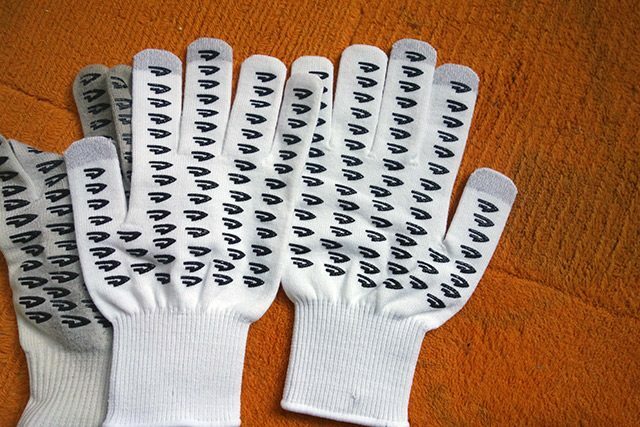 de-feet-e-touch dura gloves. An old one underneath. White isn’t best for dealing with dirty wheels. Grip is very good. A big benefit of these gloves is the rubber type grip on the inside of the gloves. This is particularly useful for riding with my Trek Speed Concept bars (without any bar tape). Other wooly gloves can be really quite slippy on these carbon bars, so it is a useful addition. Warmth. I get cold hands so am quite sensitive to warmth of gloves. These are quite warm without the bulk of a big ski glove. I can wear them down to 5 or 6 degrees for racing. The temp guide by manufacturer is 6-16 degrees. Long cuffs. In theory, the gloves go down to the end of your wrist helping to cover up that gap between the end of gloves and the start of arm warmers. Keeping your wrists warm definitely helps keep your hands warm too. Breathable. They are quite breathable and I can wear into early summer, even in double digits temperatures (10 degrees plus) without getting too hot. E-touch. I do sometimes use iPhone whilst riding, the e-tap at the end of thumb and forefingers means you can leave your gloves on to swipe away. This is a useful addition to the old version. Aerodynamics. Most cyclists won’t worry too much about aerodynamics of gloves, but it is an issue for me. Better than bigger stockier gloves, but it is no aero glove. Yesterday, when racing I put a pair of large aerogloves over the top of these. 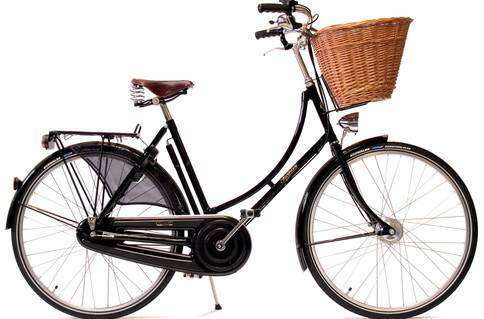 The Pashley Sovereign is a classic style bicycle for the real bicycle lover. Based on traditional bike design it is lovingly put together; it will appeal to those wanting to ride a bike with a strong pedigree, but not looking for a super quick bike. You might say the Pashley is the Rollys Royce of bicycles, but that wouldn’t be really correct because a Rolls is flash, ostentatious and expensive, the Pashley isn’t. The Pashley is more of a lovingly restored vintage car you’ve picked up for a few thousand. It’s not often you get the chance to get a really great vehicle and still have change from a £700. DHB’s flashlight series is all about high-visibility in darkness and low-light conditions, so it’s aimed more at commuters and those training solo rather than the bunch-rider. 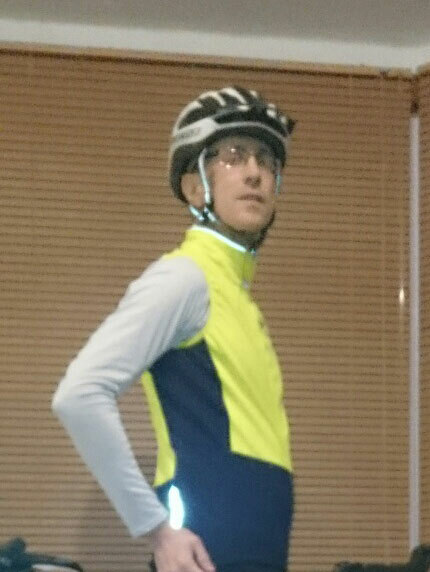 There are lots of high-viz gilets around so why would you choose the flashlight? Well number one reason would be that it’s very weatherproof. The windslam membrane does what it says on the tin – no icy blast is going to penetrate this fabric, so the core of your body will always be warm when you’ve got this gilet on and zipped up. As with most windproof membranes, it also keeps a fair amount of rain off. Not 100% waterproof on a long ride in the rain but certainly adequate protection on a rainy commute of up to an hour in my experience. A brushed micro-fleece inner fabric adds insulation so it’s ideal for midwinter riding. The high visibility comes from the majority of the garment being a vivid fluoro yellow, but there are generous areas of reflective scotchlight taping as well, which will shine out when hit by car headlights. These care on the rear of the gilet and around the front/neck and shoulders too. Comfort-wise, the fit is surprisingly sleek for a bit of commuter kit, but with lots of stretch in the fabric you shouldn’t have trouble getting into it if you’re blessed with a fuller figure. There are nice details too, like a gripper around the hem to stop it riding up and a “zip garage” at the neck to stop the zipper from chafing. 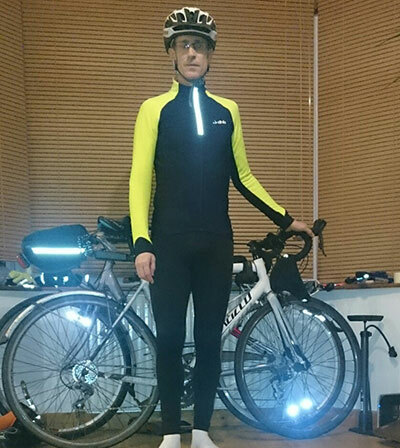 In all my rides in the Flashlight Gilet so far, I’ve been warm enough in all weathers and confident that I’m totally visible (through a commute that varies from unlit cycle paths to a busy city centre). The construction seems good with robust zips and stitching so I expect to be riding to work in this for a good few years. 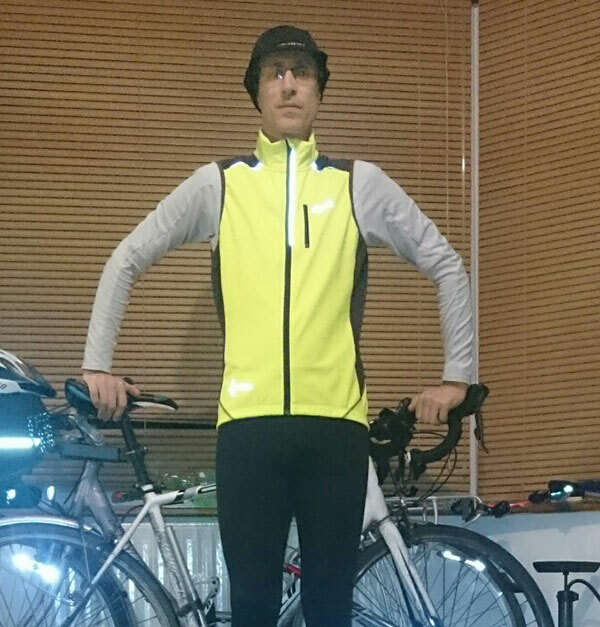 With this jersey priced at £60 I was expecting something functional but basic – in fact it’s a really versatile and well-designed piece of kit that I am already wearing day in and day out. The thermal, moisture-wicking fabric is tightly woven with a brushed texture on the inside for warmth on the front, sides and front-of-sleeves but the underarm panels and middle of the back are a lighter and more porous mesh that lets your body breathe without allowing the chill to penetrate where it shouldn’t. I’ve found this top just right in cool to cold conditions, but the stretchy fit allows you to slip a thermal or windproof baselayer underneath for days when the temperature is right down around freezing point. Cycling at this time of the year is dominated by how to keep warm, especially fingers and toes. The warmest socks I’ve found are these heat holders – a thick pair of tubular type socks. They have a thick layer of fibres to keep wthe armth in. The length of sock means heat rises up the foot and ankle, keeping whole foot area warm. There is no elastic to constrict the blood supply. They are pretty chunky and in terms of aerodynamics, pretty useless, but for keeping feet warm, they are as good as they get. They are the warmest sock I’ve found. Don’t worry about sizing they are very elastic. If you wear them around the house, they don’t last forever, and bits of fibre do start to come off. I have worn holes in the heels of some socks I’ve had for two years. But, I bought a new pair recently because they are still excellent value. If you want to keep feet warm, these are very good. As the weather warms up, they can become too hot, but they don’t get too sweaty, there is room to breath too. As mentioned in recent post on hotpads, I get very cold feet, so I use an inner pair of socks, a pair of hotpads and then these heatholders on top. Cold feet will never be an excuse to stop cycling. 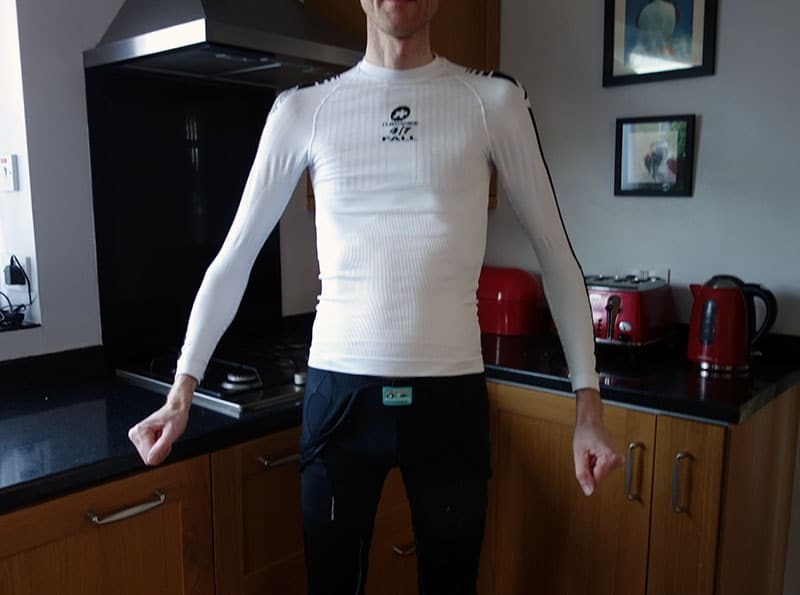 The Assos LS Skinfoil longsleeve base layer is a top of the range base layer, designed to offer comfort and temperature control. In summary – expensive, but very good. I bought the Climarange 4/7 Fall version, as that seemed to offer the biggest range of temperatures for the base layer to be useful. I have used it over the winter (mostly wet and mild). But, also used it this weekend, cycling in pretty chilly temperatures of 2 degrees. I took size L, (waist 30-32) which was a good fit, allowing for my lanky body shape. I would have liked arms to be a little longer, but it felt close to the skin without being tight in any particular parts. Assos say that it is manufactured like a tubular design (rather than flat bed). This seems to mean it has better contours to the shape of the body. The Ortlieb urban pannier is a sturdy construction of waterproof materials. It has a 20 litre capacity and even can be adapted into using as a rucksack. The bag is well made and looks quite good. As commuting bags go, the coffee linen material is quite stylish. 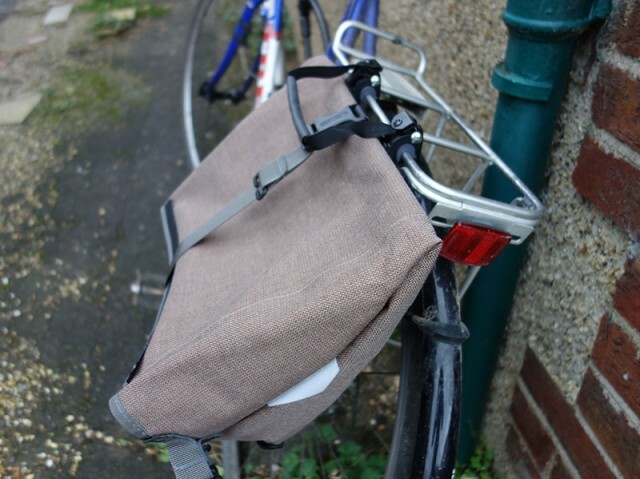 Ortlieb panniers come with quite a high price tag – £65, but as a compensation it is well made, although I’ve only had a few weeks, it gives the impression of being long-lasting. With 20 litres capacity, you can fit quite a lot of shopping in there. The above photo was taken with just a laptop inside. It looks a little floppy. I use a pannier back for commuting into town. I often fill it up with shopping so am looking for a robust pannier bag, that you can also sling over your shoulder. Hotpads are small disposable packets that can be slipped down a pair of socks to keep your feet warm when it’s very cold. If you wear thermal socks and a good pair of overshoes, you might not need them. But, for many with poor circulation in the extremities, these can be the difference between being able to cycle in the cold and getting too cold. It doesn’t matter if you buy hotpads for feet or hands, they are 100% interchangeable. This has been one of the mildest winters so far and I haven’t needed to use too many. But, the cold spell this week (less than 5 degrees) means I definitely will be using. Basically, when you take them out of a plastic wrapping some chemical reaction creates heat which lasts for seven hours. I put them in my cycling shoes just above a pair of socks. They are great for long rides. Also, when you’re feet get very cold, the temptation is to wear several layers of socks, but when you squeeze into your cycling shoes, the socks can actually constrict your blood flow, a key factor in making you cold. They really do work. It’s not a gimmick. They are 100% reliable. Even after 5 hours, you can still feel the heat. I always use a thin layer of socks, then put the hotpad and then a thicker layer of socks to keep the heat. This particular brand is good because the pads are quite small, but provide just the right amount of heat to avoid feeling scorched, but also to provide a heat source. Also, useful if you get a puncture in freezing weather and have to take off your gloves to mend a puncture. I will use them in some early season races. I’d rather have the extra weight than toes going cold and cramping for lack of blood. I have tried the re-usuable hotpads. You can re-energise them in hotwater or microwave – depending on the model. However, these tend to be bigger, and much more difficult to get into a pair of cycling shoes. Also, I find they may only last for one or two hours. My philosophy is that winter cycling is tough enough. I always try to do anything to make the ride more comfortable, enjoyable. Hot pads are my saviour for winter riding. If you have very good blood circulation, you may not need them unless it goes below freezing. 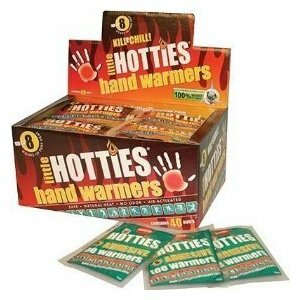 But, if you do suffer from cold hands and cold feet, definitely give these a try, buy a box – forget about the cost. And then you have one less excuse for not going out in winter! The Scicon Aerocomfort bike bag is a soft case bag for transporting a bike. It is unusually wide at one end to minimise the amount of bike dismantling required. Although it is a soft case, it is reasonably well padded. I spent a long time trying work out the best bag to buy. In the end I went for this. I recently used on a trip to Sicily.
. 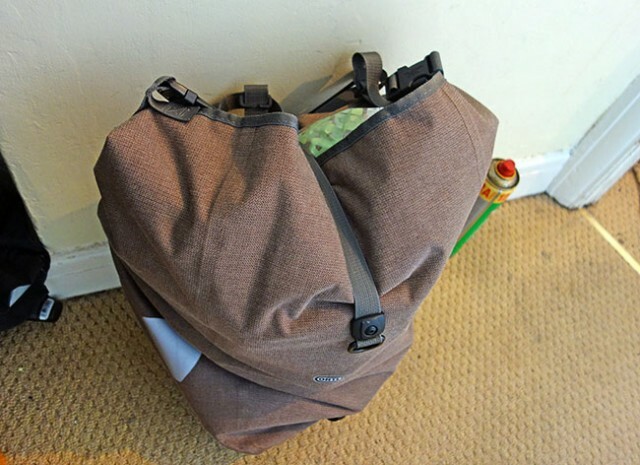 The bag – a little unusual shape, but not much bigger than other bike bags. It doesn’t particularly look like a bike bag. Separate compartments for wheels. This was a big improvement on my last bike bag because there the wheels were loose in the bag. The wheel sections are quite well padded. 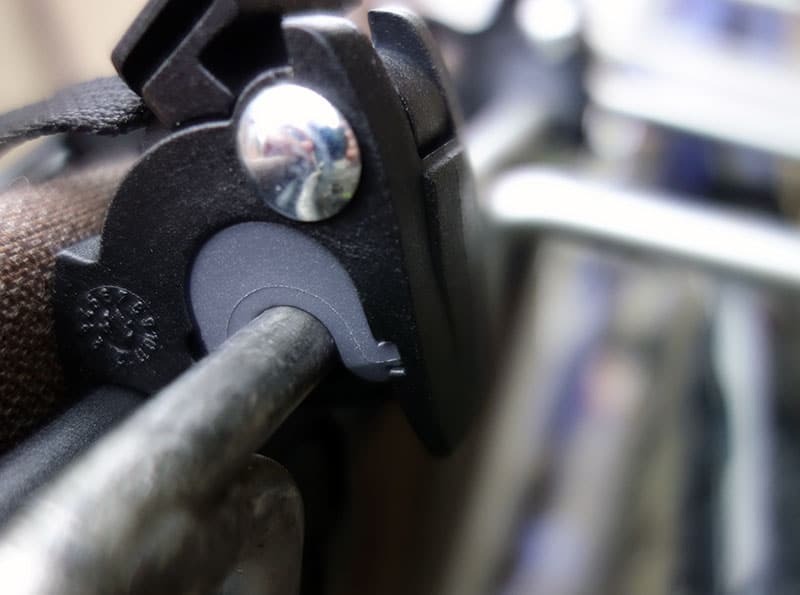 No need to dismantle handlebars – One end is wide enough to take. I’ve always used lightweight jackets and gilets before – the type that fold up to the size of a satsuma at most and give reasonable wind protection but not a lot of warmth. This softshell gilet is very different – it has a windproof / water-repellent outer fabric and a warm microfleece lining, so even when packed flat it’s about the size of a couple of thick-cut sandwiches. On the plus side, it’s been perfect for such a wide range of conditions this winter that I’ve not had to take it off and find room in a pocket for it. 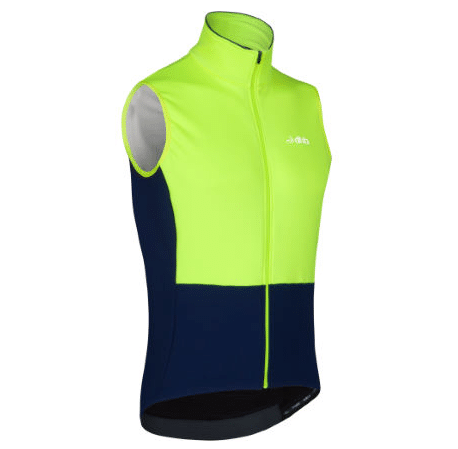 The softshell gilet is part of DHB’s performance range, so it’s aimed at the serious cyclist wanting good value training kit rather than the commuter or occasional rider. Having worn it for a few weeks of winter weather though, I’d say just about anyone who rides in all weathers will love this piece of kit. flap which protects from wind penetration and also prevents any rubbing at the neck. My favourite feature is the storage – 2 very large, stretchy pockets give me space to carry all the gear I need on a long ride (bananas, bars, lightweight waterproof etc.) or my winter commute (small lock, bunch of keys, wallet, etc.). Honestly you can cram a lot of gear in there and the flaps at the top of the pockets make sure it stays put while still allowing easy, fumble-free access when you’re riding. There’s good reflective trim at the back, a reflective logo on the front and if you opt for the navy/fluoro colourway as I did you’ll be seen from miles away. If you are more worried about how you look than how well you get seen in the dark, there’s a cool-looking black version available too. Verdict – warm, windproof and showerproof with a sleek, body-hugging fit and generous storage.